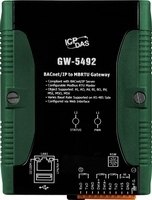 GW-5492 is a fully configurable universal Modbus RTU to BACnet/IP gateway. The GW-5492 includes BACnet/IP Server and Modbus RTU Master which is used to make Modbus RTU devices accessible on a BACnet network. BACnet (Building Automation and Control Networking) protocol has been designed specifically to meet the communication needs of building automation and control systems for applications such as heating, ventilating, air-conditioning control…etc. The GW-5492 contains a large number of BACnet objects (AI, AO, AV, BI, BO, BV, MSI, MSO, MSV) gives you flexibility in mapping Modbus RTU registers to any combination of BACnet objects. Multiple BIBBs (DS-RP-B, DS-RPM-B, DS-WP-B, DS-WPM, DS-COV-B…etc.) are supported. All the data transfer is configurable using a standard Web browser.